Tip: Whenever the term active reports is mentioned, it includes active reports for Adobe Flash Player and for PDF, unless otherwise noted. Use AHTML (HTML active report), FLEX (active report for Adobe Flash Player), or APDF (active report for PDF) as the report output format. 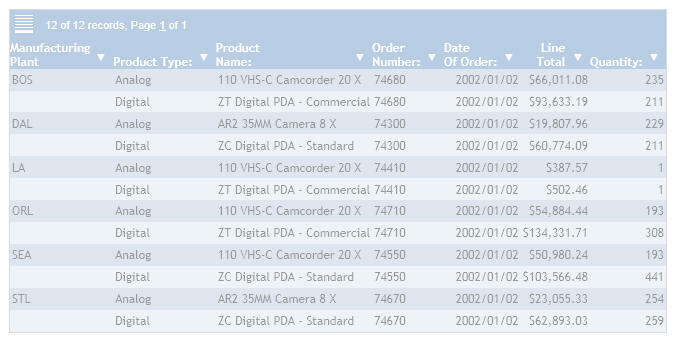 Viewing reports in either tabular or expandable formats. Applying calculations to columns and choosing the location to display results. 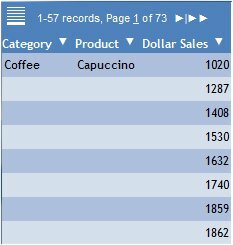 Controlling the display of data by hiding or freezing columns. Limiting the number of rows displayed per page. 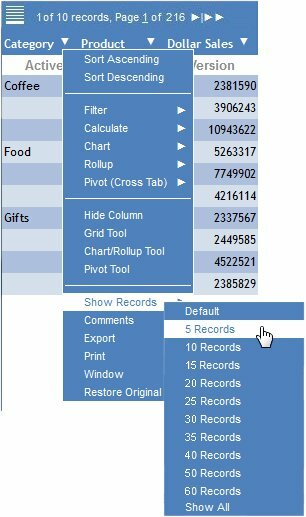 Adding a graphic visualization column to compare column values. Customizing the colors for most of the report components. Displays the report output in a web browser in the format specified. PCHOLD is the default value. Saves the report output to a temporary file for later use. Saves the report output to a file for later use. Creates an HTML version of the report. Creates an Adobe Flash Player version of the report (Adobe Flash file). Creates an Adobe Flash Player version of the report (Adobe Flash file), embedded in a PDF file. The following code generates an HTML active report. All customized (non-default) values and corresponding keywords, used to specifically format an HTML active report, are shown in bold. Starting at the top of the report, notice the customized background colors, the record status and page navigation bar, and the calculation row at the bottom. The following image shows the same report in which the first data row is highlighted. The mouse is pointing to the fourth data row. Some of the formatting options can only be controlled or implemented from the user menus in the output of an active report. For more information about these options, see User-Controlled Options in an Active Technologies Report. You can set the initial state of an active report by customizing many report options with WebFOCUS t syntax. You can enable or disable some options prior to distribution to users. The following syntax sections describe the options you can control. Creates a tabular report. OFF is the default value. The pagination and freeze options are not available with the expandable report view option. Tip: When you use active reports, it is recommended that you set the system font display to normal to ensure that the menu icons display correctly. To set the system font display, right-click anywhere on the desktop, select Properties from the pop-up menu, select the Settings tab in the Display Properties dialog box, click the Advanced button, set the Font Size to Small Fonts, and click OK. These steps are for Windows 2000. They may vary by operating system. Enables the report to display multiple open windows as tabs or cascaded windows in the web browser. 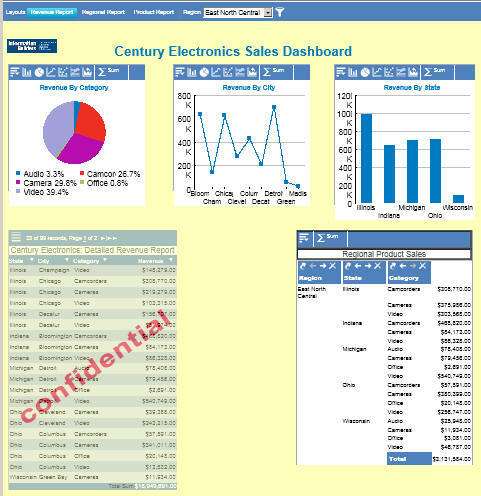 Multiple windows are created in the browser when viewing data as a chart, a roll-up table, and so on. Valid values are CASCADE or TAB. Specifies the object, which is the current row where the mouse is clicked or is pointing. Specifies the background color of the row where the mouse is pointing. The default value is RGB(255 252 204), which is a shade of yellow. Valid values can be either a preset color name in single quotes, for example, 'YELLOW', or the RGB (red green blue) numeric values, for example, RGB(255 255 153). Specifies the background color of the row selected (click anywhere within a row). The default is RGB(51 255 204), which is a mix of green and blue. Valid values can be either a preset color name in single quotes, for example, 'BLUE', or the RGB (red green blue) numeric values, for example, RGB(153 53 0). To control the user menu options, which determine the location and color characteristics of the user menu in the report, use the appropriate syntax section that follows. Specifies the object, which is the user menu. Specifies the color of the text (font) in the user menu. BLACK is the default value. Valid values can be either a preset color name in single quotes, for example, 'YELLOW', or the RGB (red green blue) numeric values, for example, RGB(153 153 153). Specifies the color for the hover text in the user menu. BLACK is the default value. Valid values can be either a preset color name in single quotes, for example, 'RED', or the RGB (red green blue) numeric values, for example, RGB(255 255 153). Specifies the color for the background (non-text) areas in the user menu. SILVER is the default value. Valid values can be either a preset color name in single quotes, for example, 'GOLD', or the RGB (red green blue) numeric values, for example, RGB(153 51 0). Specifies the color for the background area of the user menu where your mouse is pointing. WHITE is the default value. Valid values can be either a preset color name in single quotes, for example, 'ORANGE', or the RGB (red green blue) numeric values, for example, RGB(51 204 204). You can use this, along with the hover text color, to visually contrast the menu option where the mouse is currently pointing from the rest of the menu. Specifies the color for the borders of the user menu. WHITE is the default value. Valid values can be either a preset color name in single quotes, for example, 'BLUE', or the RGB (red green blue) numeric values, for example, RGB(255 255 153). To control the calculation options, which determine the column and the calculation you want to perform, along with the styling characteristics of the calculation results row, use the appropriate syntax section that follows. Specifies the description (column name or identifier) of the column for which you want to perform a calculation. Specifies the calculation to be performed. The default is no calculation. For columns containing numeric data, select from: SUM, AVE, MIN, MAX, CNT, CNT.DST, PCT.TOT. PCT.TOT values appear in a separate column adjacent to the column for which they are calculated, and styling is inherited from the visualization column. For columns containing text (alphanumeric) data, select from: CNT, CNT.DST. Specifies the top row of the report as the location of the calculation results. TOP is the default value. Specifies the bottom row of the report as the location of the calculation results. Specifies the object, which is the calculation results row. Specifies the color for the calculation values in the calculation results row. The default value is BLACK and is inherited from the column title font color. Valid values can be either a preset color name in single quotes, for example, 'RED', or the RGB (red green blue) numeric values, for example, RGB(255 255 153). Specifies the color for the background in the calculation results row. The default value is WHITE and is inherited from the column title background color. Valid values can be either a preset color name in single quotes, for example, 'GOLD', or the RGB (red green blue) numeric values, for example, RGB(153 51 0). Specifies the color for the positive values displayed in the optional visualization column. BLACK is the default value. Valid values can be either a preset color name in single quotes, for example, 'BLUE', or the RGB (red green blue) numeric values, for example, RGB(255 255 153). Specifies the color for the negative values displayed in the optional visualization column. BLACK is the default value. Valid values can be either a preset color name in single quotes, for example, 'VIOLET', or the RGB (red green blue) numeric values, for example, RGB(153 153 153). Specifies the description (column name or identifier) of the column you want to freeze. You can only specify one freeze column, which must be a BY sort field. The default value is none (no freeze column). Enables the report to freeze at a particular column that is automatically determined by WebFOCUS for optimal viewing. If you can view the entire report output on the screen without scrolling, the freeze is not applied. The freeze option is not available with the expandable report view option. To control the hide column options, which determine the columns that are hidden from view in the report output, repeat the following for each column you want to hide. Specifies the description (column name or identifier) of the column you want to hide. You can hide multiple columns, but you cannot hide all columns (at least one column must always be visible). Disables the option. OFF is the default value. Displays all NOPRINT fields in the active report menu. Suppresses the display of NOPRINT fields in the active report menu. This is the default value. Note: This setting does not affect fields that are hidden using HIDE=ON syntax. In order to simply hide a field, but make it available for later use in an active report drop-down menu, use HIDE=ON syntax. PAGINATION to enable the use of show record options. FILTER to enable the use of filtering or highlighting options. FREEZE to enable the use of freeze column options. CALC to enable the use of calculation options. HIDE to enable the use of hide column options. CHART to enable the use of chart creating options. EXPORT to enable the use of exporting options. VISUALIZE to enable the use of graphical visualization options. SORT to enable the use of sorting options. ROLLUP to enable the use of rollup table options. PIVOT to enable the use of pivot table options. COMMENTS to enable the use of comment options. WINDOW to enable the use of window type options. RESTORE to enable the use of restore options. SENDEMAIL to enable the use of send as e-mail options. SAVECHANGE to enable the use of save changes options. PRINT to enable the use of print options. ACCORDION to enable the use of accordion options. TOOLS to enable the use of Chart/Rollup Tool, Pivot Tool, and Grid Tool options. Enables the option. ON is the default value for all user-controlled options. This option applies to active reports with the AHTML output format. This setting suppresses the display of the entire active report drop-down menu and arrow image. You can display the menu and arrow again by removing the preceding setting from the active report procedure. Runs the active report with active cache enabled. Will not enable active cache when the active report is run. OFF is the default value. Specifies the number of rows from cache. The default is 100. The Restore Original menu option is not supported for an active report that contains data visualization bars. The Export menu option does not export a calculation applied to a tabular active report. Comments for an accordion active report are cleared if you sort output with the Sort Ascending or Sort Descending command. You can use the SET AREXPEXCEL command to export an active report to an Excel worksheet with the specified format. Exports an active report to an Excel worksheet with the extension xlsx. 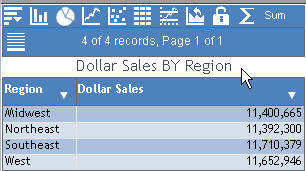 To use this feature, run the active report, and select Export, Excel, All records from a column drop-down menu. Respond to the prompt to open the Excel worksheet in a new window with all records displayed. If a filter is applied to the active report, you can click Filtered only instead of All records to export the filtered data instead of the entire report. This setting applies when the active cache option is enabled. To enable active cache in a report request, include the command ON TABLE SET WEBVIEWER ON. Exports an active report to a file with an Excel extension. Run the active report, and select Export, XML (Excel), All records from a column drop-down menu. The Excel worksheet opens in a new window with all records displayed. You can optionally perform any available Excel function. For example, click the Save icon to open the Save As dialog box. Supply the name of the folder in which the file will be saved, the name of the file, and the type of file. To use this feature, you must enable ActiveX in your browser security settings. EXL2K is the default setting for the AREXPEXCEL command. As noted for both settings, the Excel worksheet opens in a new window. Some users may need to provide the browser with permission to allow pop-ups. When you extract and save report output with the HOLD or SAVE command, you can specify FORMAT AHTMLTAB to create an output file that contains only data and parameters used in an HTML active report (output format AHTML). The output produced is not a complete HTML active report. However, you can include the output file in another HTML document using the Dialogue Manager command -HTMLFORM. For details on the HOLD and SAVE commands, see Chapter 8, Saving and Reusing Your Report Output , in the Creating Reports With WebFOCUS Language manual. For details on the -HTMLFORM command, see the documentation on Dialogue Manager in the Developing Reporting Applications manual. Extracts and saves report output. The output is saved with an associated Master File. Specifies a name for the HOLD file. If you do not specify a file name, HOLD becomes the default. Since each subsequent HOLD command overwrites the previous HOLD file, it is advisable to code a distinct file name in each request to direct the extracted data to a separate file, thereby preventing it from being overwritten by the next HOLD command. The name can contain up to the maximum number of characters supported by your operating system. For more information, see the topic Naming a Master File , in Chapter 1, Understanding a Data Source Description , in the Describing Data With WebFOCUS Language manual. Controls whether fields with the attribute MISSING=ON in the Master File are carried over into the HOLD file. MISSING ON is the default attribute. If the HOLD command specifies MISSING OFF, fields with the MISSING attribute are not carried over. For related information, see Chapter 13, Handling Records With Missing Field Values , in the Creating Reports With WebFOCUS Language manual. Specifies a name for the SAVE file. If you do not specify a file name, SAVE is used as the default. Since each subsequent SAVE command overwrites the previous SAVE file, it is advisable to code a distinct file name in each request to direct the extracted data to a separate file, thereby preventing it from being overwritten by the next SAVE command. Ensures that fields with the MISSING attribute set to ON are carried over into the SAVE file. MISSING OFF is the default attribute. For more information, see Chapter 13, Handling Records With Missing Field Values , in the Creating Reports With WebFOCUS Language manual. The SET AROUTPUT command enables you to control how and where the Active Technologies for HTML output file is generated. The SET AROUTPUT command applies to active reports with the AHTML output format. The syntax for the command is as follows. You can add the command to the profile (edasprof.prf) or to the WebFOCUS procedure that generates the active report. Applies only to connected mode. Requires the installation of WebFOCUS Release 8.0 Version 01 or higher. Note: Starting with WebFOCUS Release 8.0 Version 01, make sure to use the command SET AROUTPUT = ALL to allow users to save an active report or document with the browser Save as option. For more information on saving active reports and documents, see Saving, Exporting, and Sending Active Technologies Reports. Generates styling structures and data structures. This option is similar to AHTMLTAB. The output produced is not a complete HTML active report. However, you can include the output file in another HTML document using the Dialogue Manager command -HTMLFORM. Always use this option with ACTIVEREPORTJS. For more information on AHTMLTAB and the !IBI.OBJ.ACTIVEREPORTJS; command, see the reference section on FORMAT AHTMLTAB, in the topic Choosing Output File Formats , in Chapter 8, Saving and Reusing Your Report Output , of the Creating Reports With WebFOCUS Language manual. Determine the number of rows displayed per page and the styling characteristics of the record status and page navigation bar. For details, see Determining the Number of Rows Per Page and Styling Characteristics. Suppress the display of the pagination bar. For details, see Suppressing the Display of the Pagination Bar. This topic describes the syntax for determining the number of rows displayed per page and the styling characteristics of the record status and page navigation bar. Use the appropriate syntax that follows. Specifies the number of rows displayed on each HTML page. The default value is 20 rows when the LINES-PER-PAGE option is used. Otherwise, the server default value is 57 rows. Specifies that you want to show all the results on one HTML page. Specifies the object, which is the record status and page navigation bar. The record status and page navigation bar show row and page information, where your cursor is positioned, relative to the total number of rows and pages in the report (for example, 10 of 100 records (10.00%), Page 1 of 3). Specifies the location of the record status and page navigation bar, which is either at the top of the report above the report header, or at the bottom of the report below the report footer. TOP is the default value. Specifies whether you want the information in the record status and page navigation bar to be centered, left-justified, or right-justified. CENTER is the default value. Specifies the text color for the record status and page navigation bar. BLACK is the default value. Valid values can be either a preset color name in single quotes, for example, 'GREEN', or the RGB (red green blue) numeric values, for example, RGB(153 153 153). Specifies the background color for the record status and page navigation bar. SILVER is the default value. Valid values can be either a preset color name in single quotes, for example, 'WHITE', or the RGB (red green blue) numeric values, for example, RGB(51 153 102). The pagination options are not available with the expandable report view option. By default, the strings and parameters used to display the pagination bar are stored in the irpstr.js file. The irpstr.js file is located in the \home\etc directory on the WebFOCUS Reporting Server. Rename the files. Do not delete them, as you need the customized contents from these files. In your application folder, create a new, empty text file, and name it irpcusf.js. In the irpcusf.js file, enter the code that customizes the pagination bar. You can have different customized irpcusf.js files for each of your applications. This feature enables you to update the active reports and active dashboards in your existing applications with different pagination bars that meet your specific application needs. Important: The application folder must be the same one that contains the active report or active dashboard. For example, from the Projects on localhost area in Developer Studio, create the irpcusf.js file in the Other subfolder of the project folder. Using a text editor, open the irpstr.js file in your application folder, and copy the following code into it. Combine the second and third lines shown here so that they are a single line. Save the irpcusf.js file, and close the text editor. Run an active report with format AHTML. The pagination bar is displayed as follows. By default, 57 records are displayed on each page. As a result, the customized pagination bar displays a range of 1-57 records on the first page. To change the default number of records displayed on each page, open the active report in Report Painter or InfoAssist. Follow the steps for the tool that you are using. 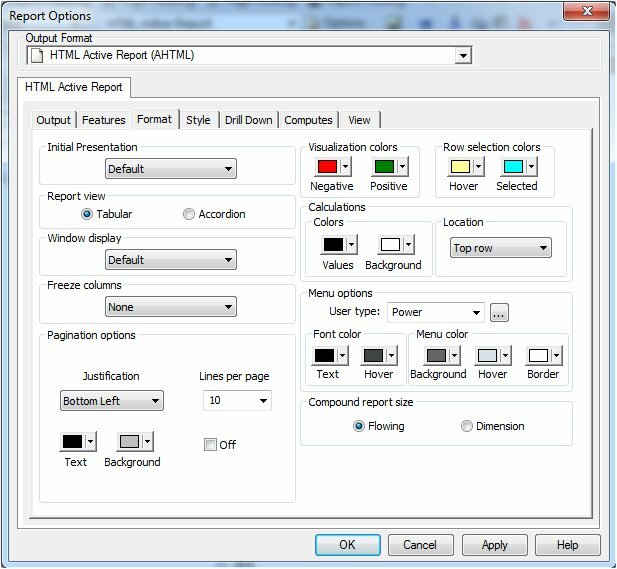 Open the Report Options dialog box, and click the Format tab. In the Pagination options section of the dialog box, click the desired value from the Lines per page drop-down list. In the following image, 10 lines per page have been selected in the Pagination options section of the Report Options dialog box. You can also set styling characteristics in the Pagination options section. From the Justification drop-down list, click the value for the location of the pagination bar and for the text justification. For example, if you click Bottom Left, as shown in the preceding image, the pagination bar will be located at the bottom of the report, and the text inside the pagination bar will be left-justified. The default value is Top Center. From the Text drop-down list, click the desired color for the text inside the pagination bar. The default value is black. From the Background drop-down list, click the desired background color for the text in the pagination bar. The default value is silver. With the active report open in InfoAssist, click the Format tab. Click the Active Report Options button. Under Page Options on the General tab, select the desired value from the Records Per Page drop-down list: All, 10, 20, 30, 40, or 50. Alternatively, you can type a value in the input field. The default value is 57. You can also set other characteristics in the Page Information section under Page Options on the General tab. Select Display Page Information to display the pagination bar, or deselect this check box to suppress the display of the pagination bar. Click the button for the desired alignment of the pagination bar (left, center, or right). From the drop-down list, select the desired location for the pagination bar (top row or bottom row). Click OK on the General tab. The pagination bar now displays 10 records per page, as shown in the following image. Based on the styling characteristics supplied in Report Painter , the pagination bar appears at the bottom of the page, and the text inside the pagination bar is left-justified. Tip: You can also specify the number of records to display per page when a report is run. Click Show Records from a drop-down menu on the report. In the following image, 5 Records per page is selected. You can suppress the display of the pagination bar using WebFOCUS StyleSheet code. This feature is available for active reports with format AHTML, FLEX, or APDF. Once you suppress the display of the pagination bar, you can no longer navigate to a page after the first page if the number of records in the report exceeds the records (lines) per page that you set. The following options can be implemented only from the user menus in the output of an active report. Basic information for each of these options provides a more comprehensive understanding of this type of report. If the ALLOW-SORT option is enabled, you can sort columns in either ascending or descending order. For string data types, the sorting is alphabetical. For date data types, the sorting is chronological. When the report view option is tabular, only single column sorts are supported. When the report view option is expandable, an inner sort is also supported. If the ALLOW-VISUALIZE option is enabled, you can display visualization graphics in a new column inserted into the report to the right of the selected column. Negative values appear with colored bars that extend to the left of center, and positive values appear with colored bars that extend to the right of center. If the ALLOW-CHART option is enabled, you can create charts using roll-up tables. All applied filters are respected, and all calculation methods are available to create aggregation charts. A selected BY sort field and a measure column are required. There is also an option to open charts in separate browser windows. If the ALLOW-FILTER option is enabled, you can filter or highlight data. Filtering limits the output to display only data that meets the criteria in the WHERE clause specified with the user menus. Highlighting changes the color of the data in the output based on the criteria in the WHERE clause specified with the user menus. When multiple active reports are inserted in the same HTML page, you can apply filters on all reports containing a common BY sort field. The AREXPIRE parameter enables you to specify when an active report expires and the report output can no longer be displayed. Is the expiration date in the format of a two-digit year (yy), two-digit month (mm), and two-digit day (dd). For example, if you want the report to expire after June 30, 2013, specify the value 130630. Note that this is the last valid date on which you can display the report. Starting on July 1, 2013, you can no longer display it. Use this option to set the expiration date for a report at run time, or to set the expiration date for a saved report. If you leave the report open in the browser, any user interaction generates a check of the expiration date. The report is disabled if it has expired. Is the number of days from the current date on which the report expires. Valid values are from 1 to 999. This option does not apply to a report at run time. Use this option to set the duration of a saved report, that is, the length of time during which you can display the report. For example, if you want the ability to display the report for three days from the current date of August 1, specify the value 3DAYS. You can display the report on August 1, 2, and 3. Starting on August 4, you can no longer display it. The ARPASSWORD parameter enables you to set a password that is required to view active report output. Prior to opening the report output, the user is prompted to enter a password to unlock the report. Is a character string up to 32 characters in length. Only standard alphanumeric English characters are allowed in the password for an active report in AHTML format. National Language Support (NLS) characters are not allowed in the password. Any NLS character in the password for an AHTML report makes the password invalid. The HTMLEMBEDIMG parameter on the SET command enables you to embed an image in an Active Technologies report in HTML. Embeds the image in an Active Technologies report in HTML using base-64 encoding. When the command is set to ON, the HTML payload size of the Active Technologies report is smaller. This feature is supported by Microsoft Internet Explorer version 8 and higher. If you are replacing image files for icons used in Active Technologies HTML, the size of each image file is limited to 10 kilobytes (KB). The browser only supports up to 32 KB of encoded images, and base-64 encoding triples the actual image size. JPEG format is preferred, as it compresses the files to the smallest size, but PNG is also supported. Embeds the image using the Active Technologies image compression engine. Previous versions of an Active Technologies report in HTML used this method. Embeds the image using both base-64 encoding and the Active Technologies image compression engine. This is the default value as of WebFOCUS Reporting Server Release 7.7 Version 04. This value supports Microsoft Internet Explorer version 6 and 7 browsers that do not support base-64 encoded images. The HTML payload size of the Active Technologies report increases by default, as the same images are embedded twice in the report. 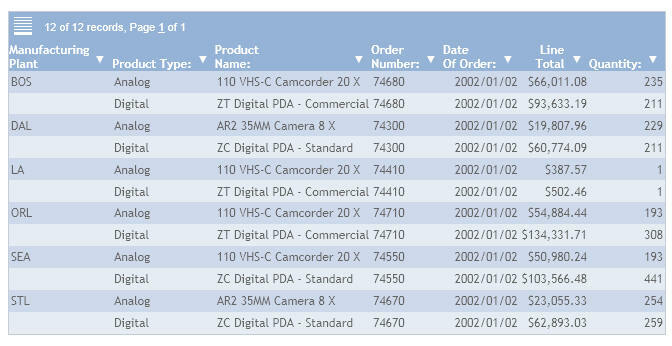 When using a rollup table generated from a tabular active report, you can either display the heading that is supplied by Active Technologies, or display a custom heading that you supply in the original tabular report procedure. In the rollup table, this setting displays the heading that is supplied by Active Technologies, whether or not a custom heading is supplied in the original tabular report procedure. If you do not supply a custom heading in the original tabular report procedure, and you do not include the ARDEFAULTHEAD attribute in the procedure, ARDEFAULTHEAD defaults to GENERATED. If you supply a custom heading in the original tabular report procedure, this setting displays the custom heading in the rollup table. If you do not supply a custom heading in the original tabular report procedure, this setting displays the heading supplied by Active Technologies. If you supply a custom heading in the original tabular report procedure, but you do not include the ARDEFAULTHEAD attribute in the procedure, the rollup table automatically displays the custom heading, that is, ARDEFAULTHEAD defaults to ORIGINAL. To display the heading supplied by Active Technologies, you must specify ARDEFAULTHEAD=GENERATED. In this example, the procedure contains a custom heading, ABC COMPANY CONFIDENTIAL. ARDEFAULTHEAD is not included in the WebFOCUS StyleSheet code. By default, the tabular report and the rollup table display the custom heading from the tabular report procedure, as shown in the following two images. You can set the ALPHA background color of an active report or chart, and each report or chart object on an active dashboard, so that the color is transparent. The ALPHA background color includes the background color of the data in the report or chart, and alternating background colors. This capability enables you to place an image in the background of a report or chart. For example, you can add a watermark behind a report. This feature applies to all Active Technologies output formats (AHTML, FLEX, and APDF). In the remainder of this topic, the terminology active report or report includes active chart. In the following example, the ALPHA background color of the tabular report on the left of the active dashboard is set so that the color is transparent. 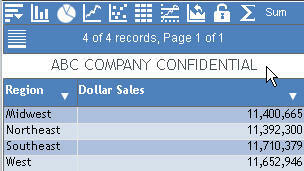 The image of the message confidential is placed in the background of the tabular report. Is a value from 0 to 100. It controls the transparency of the background color of the report. Is the name of the image file that you want to place in the background of the report. The image may be a watermark. GIF, JPG, and PNG image formats are supported. Is the position of the image from the left edge of the report, in the units of measurement set for the report (for example, inches, centimeters, or points). You can set the units of measurement for a report using the UNITS keyword in your WebFOCUS code or using a graphical tool, such as Report Painter or InfoAssist. For more information, see the applicable reporting language and reporting tools manuals. Is the position of the image from the top edge of the report, in the units of measurement set for the report. The following example sets the ALPHA background color of an active report to 50. Is the name of the report. The following two examples show the varying transparency generated from different values of ALPHA. In the first example, the value of ALPHA is 40. In the next example, the value of ALPHA is 60. Eight sets of icons for Active Technologies are packaged with the product. You can specify the set of icons that will be applied to an active report, chart, or dashboard by adding WebFOCUS code to the report, chart, or dashboard procedure. Create your own set of icons by customizing the combination of packaged icons. Create new icons and add your own custom icon set to your application folder. For details on creating your own custom icon set and applying it to an active report, chart, or dashboard, see Creating a Custom Icon Set for an Active Technologies Report or Dashboard. Indicates the standard combination of icons. It uses icons in dark blue, except that the active tabular report menu drop-down icon, filter icon, window title bar icons, and pivot icons are in white. This is the default value. Note: A pivot icon that represents an option that is currently inactive is in gray. An example is the inactive option to move a leftmost column on a pivot table farther to the left. This feature applies to all the icon sets. Indicates that all the icons are white. Indicates that all the icons are white, except that the window resize icon is dark blue. Indicates a reverse combination of icons. It uses icons in white, except that the active tabular report menu drop-down icon, filter icon, window title bar icons, window resize icon, and pivot icons are in dark blue. Indicates the same combination of icons as REVERSE, except that the filter icon is white. Indicates that all the icons are dark blue. Indicates that all the icons are dark blue, except that the filter icon is white. Indicates the original set of Active Technologies multi-colored icons. is included in the procedure that generates the following chart. All the icons on the chart are white. Rename the "default" style section of the irpcfgu.js file. Assign a unique, descriptive name, such as "mystyle". Customize the "mystyle" section of the irpcfgu.js file. Refer to the "mystyle" section of the irpcfgu.js file from your WebFOCUS procedure. For details on defining custom styles in the irpcfgu.js file and applying them to an active report or dashboard, see Defining Custom Styles for an Active Technologies Report or Dashboard. Is the name of the section in the supplied irpcfg.js file that defines the default styles for an active report or dashboard when no style sheet is specified in the report or dashboard procedure. This is the default value. Is the name of the section in the irpcfgu.js file that contains the custom styles for an active report or dashboard. The name can be up to 48 characters long. The following apply when you use active reports. Different types of browsers handle text wrapping differently in the cells of a tabular active report when you do not specify an explicit text wrapping option in the report procedure. For more information on the available text wrapping options, see the Creating Reports With WebFOCUS Language manual. When displaying data in a tabular active report, different browsers handle a hyphen (-) in the data in different ways. Internet Explorer 9 splits the single string (MS01224-1212) into the two strings (MS01224- and 1212) in an attempt to wrap the data. Mozilla Firefox keeps the single string (MS01224-1212) as one word and expands the column width to accommodate it. Mozilla Firefox splits the data to respect the column width. For more information on the WebFOCUS StyleSheet attributes that affect column wrapping (WRAP and SQUEEZE), see the Creating Reports With WebFOCUS Language manual.